The actors of the Turkish tourism sector foresee a major increase in the number of Russian tourists this year, as prices fall and ties ameliorate. Turkish tourism experts forecast a tremendous increase in the number of Russian tourists this year, with about 5 million people expected to visit the country. Tourism sector representatives from 10 different countries gathered in Russian capital Moscow on Saturday to discuss the most recent upcoming trends in the sector at the World Tourism Forum's Russia Summit 2017, for which Turkuvaz Medya was the media sponsor. More than 350 participants including heads of tourism agencies, tour operators, hotel chains and transport companies from countries like Turkey, Russia, Spain, Morocco, Sri Lanka and Greek Cyprus participated in the event to discover new ideas that would help grow their businesses. Russian tourists have been visiting Turkey for over 25 years as the warm beaches in the country have always appealed to the cold country's people. In 2014, the number of Russian tourists visiting Turkey peaked at 4.5 million, making Russia second on the list on Turkey's arrivals list. However, the number declined to 3.6 million in 2015 and plummeted further in 2016 to approximately 800,000 - December's data has not yet been announced - after the Nov. 24, 2015 incident in which Turkish F-16 jets downed a Russian Su-24 bomber for violating Turkey's airspace. Moscow implemented sanctions on Turkish goods and refused work permits to Turkish workers, and the Russian government also called on its citizens to not travel to Turkey. Fortunately, with the normalization of relations, the Turkish tourism sector now has higher hopes about Russia. Turkish organizers of the World Tourism Forum preferred to hold the summit in Moscow, after organizing one in Antalya last month, giving the message that they missed their Russian visitors and their visitors also missed them. 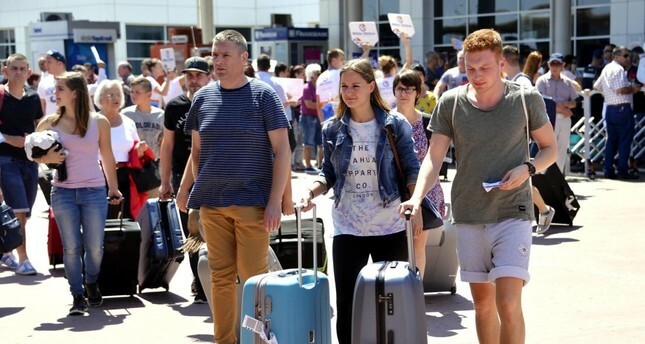 Neşet Koçkar, chairman of Anex Tour, one of the leading tour operators in Russia, said they expect the number of tourists coming to Turkey to reach 5 million as relations go back to normal and Russians have not been satisfied with the service quality in the alternative countries they have chosen last year. Koçkar also noted that Anex Tour plans to bring 1 million of that number to Turkey. "We are receiving early reservations, five times higher than 2015, proving that our guests missed Turkey," Koçkar said. Russians, who could not travel to Turkey last year, made two different decisions. Some stayed at home as they faced financial troubles due to the country's struggling economy, while some preferred other destinations, which they eventually turned their back on as a result of bad service quality, according to Koçkar. Turkey dealt with a number of security problems in 2016 due to terrorist attacks taking place in the country and there were political issues between Ankara and Moscow. "But, a crisis is a crisis when it takes place. When it is over, it turns into opportunity," Koçkar said, mentioning that they are planning on cutting prices in tourism by about 40 percent seeking to attract more Russians. A type of tourism activityi in which large groups convene for a particular purpose, Meetings, Incentives, Conferences, and Exhibitions (MICE) industry is also optimistic about 2017. Bünyat Özpak, managing partner at Inventum MICE, said they expect Russian groups coming to Turkey will peak in 2017 as relations futher improve and Russian economy starts to heal. About two months ago, President Recep Tayyip Erdoğan announced the beginning of a new period for foreign trade transactions in which local currencies will be used to obviate the pressure of exchange rates, securing a prompt response from the Russian Central Bank. The president's call has turned into action between the Russian and Turkish central banks as they have built the infrastructure to make the transactions possible and also motivated banks and companies to produce alternative services like Turkey's Deniz Bank, which is owned by Russian Sberbank. Deniz Bank CEO Hakan Ateş said that they have already established call center services in Russian language and ATMs that withdraw rubles are now available. He also said that they are working with tour operators and hotels to make payments in Turkish lira and Russian ruble. "Russians will feel at home in Turkey," Ateş said. World Tourism Forum Chairman Bulut Bağcı said the summit gathered together leading tourism companies from Russia and Turkey to provide them a platform to discuss upcoming potential. Pointing to the sessions in the summit, Bağcı said the event was also aimed at discovering more about the Russian market. The summit itself created $7 million in trade volume, the forum chairman stated. The World Tourism Forum's main event will be held in Istanbul on Feb. 16-18. "As of today, we have more than 3,000 participants registered for the event in Istanbul," Bağcı noted. Another summit will follow Istanbul on April 24 in Dubai. "Besides creating dynamism for the tourism sector, we are aiming to create a total trade volume of $1 billion by organizing events in Europe, Africa, the U.S., Asia, the Middle East and in Turkey and Russia as our special markets," Bağcı said.